You’ve probably noticed this already about your little brother or sister, but babies sleep A LOT. Sometimes, they can sleep 14-16 hours a day! They don’t do it all at once, however. They usually will sleep for a few hours at a time, wake up for a while to feed or have their diaper changed, and then go to sleep once more. That is why your parents have to get up during the night to take care of him or her. You would think that laying a baby down to sleep would be a pretty easy thing, right? Wrong! There’s actually a lot to know about babies and sleeping! The most important thing is that the baby must be on his back to sleep. Sleeping on his tummy or on his side can increase the risk of Sudden Infant Death Syndrome (SIDS). If parents see that a baby has rolled over onto his tummy or side while sleeping, they can gently return him to an on-the-back position. The safest place for a baby to sleep is in a crib in the same room as your parents but not actually in bed with them. Some parents, however, will buy a bassinet which attaches to the side of the bed, so they can be close to the baby but still have a safe place for it to sleep. In many sound tempting to put a baby to sleep with a soft woolly blanket or toys but these actually are a choking or strangling hazard if a baby gets caught up in them! Most parents will put their baby in a sleeper (like pajamas) or a sleeping “sack” to keep them warm. Many parents will also swaddle their baby with a blanket to before they put them down to sleep. Read the section below to find out more about swaddling. Although toys are not okay to sleep with, it is ok to sleep with a pacifier, as long as parents don’t put it on a string or cord around a baby’s neck. Pacifiers can help babies to “self soothe”, or get themselves back to sleep when they wake in the night. Turning off bright lights and making sure the room is quiet and is at a comfortable temperature will also help babies get to sleep – and it can help big kids and grown-ups too! Some parents will have a “night-night” routine to help their baby sleep better. Often, they will feed the baby, give him a warm bath to relax him, and then lay him down with some quiet music so that he can drift off to sleep on his own. Swaddling babies is actually an art that goes back thousands of years, and parents all over the world have some form of swaddling for their babies. Swaddling is great for newborns and infants because it makes them feel warm and secure and can help them to sleep better and be less fussy or stressed. Below is one good techniques for swaddling a baby. Lay a receiving or other small, lightweight blanket down on the bed or changing table so that is it is in the shape of a diamond. Lay the baby down so that his head is at the “tip” of the diamond. Make sure his arms are resting comfortably at his sides. Take the right side of the blanket and wrap it across the baby, tucking it in securely (but not too tightly) under his left side. Take the left side of the blanket and wrap it across, tucking it under the right side. Take the bottom tip of the blanket and tuck it up under the blanket material on the baby’s stomach. Essentially, swaddling is like making a baby “burrito” where the baby is wrapped securely around his arms and body, though his legs are still free to move. Swaddling can be done up until the baby is old enough to roll over on his own. 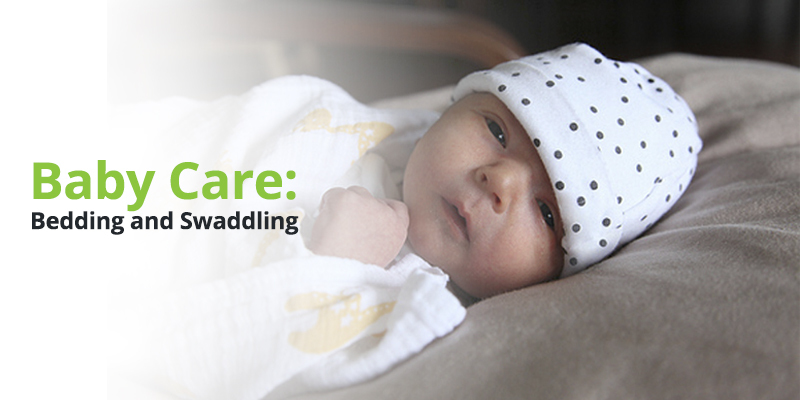 At this point, swaddling could become a hazard if the baby gets tangled up in the blanket. For young babies, though, it is a great way for parents to get their baby soothed down and ready for a good nap! So watch your parents the next time they lay your baby brother or sister down to sleep. It may look easy, but there is actually a lot to think about! As the baby grows, he will eventually move from a bassinet or crib to a small bed (probably one a lot like yours) and will not need as much help getting to sleep. And that means mom and dad will be getting more sleep, too!